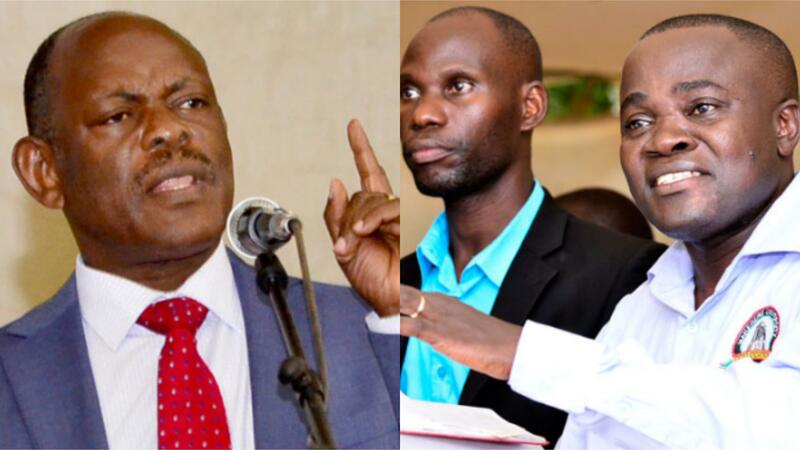 MAKERERE – Prof Barnabas Nawangwe, the Makerere University Vice Chancellor has explained his decision to sack Muasa boss Dr Deus Kamunyu. In a January 22 statement issued on social media, the VC said that Dr Kamunyu was fired for his personal transgressions and not as Chair Muasa. Prof Nawangwe also castigated many people jumping up to shed crocodile tears about the suspension of Dr Kamunyu saying the Muasa boss was meddling into management affairs. many colleagues who have worked for long to build their reputation?”. The duo has since last been at war, throwing bitter words to each over governance matters at the University. In June last year Dr Kamunyu ran to the staff e-mail list to report harassment and intimidation by Prof Nawangwe. This was after the VC issued Dr. Kamunyu with a June 12 warning letter for his stance on university management matters including illegal appointments and land grabbing among others. “Colleagues, it’s now official that we are being intimidated by Management to stop our quest for the restoration of systems and accountability for resources,” Dr Kamunyu wrote, vowing that the association will not waver in asking some questions. “We will remain strong in our mandates because those who read industrial relations literature know very well that it’s never easy,” Kamunyu wrote. The VC accuses Dr Kamunyu of making “unsubstantiated allegations” in the media and on the university e-mailing system against officers and organs of the university intended to create bad publicity of the institution and officers in the management. The VC cited that Dr. Kamunyu made allegations” key among them — illegal appointments by the board, illegal amending of the Human Resources manual by the Council, internal land grabbing among others. “These un-substantiated allegations coming from coming from a person with responsibility in the university are damaging not only to the individual officers but to the image of the Makerere University,” the VC wrote. “This is therefore to require you to desisit from making such allegations … failure to abide by this directive will leave me with no alternative but to forward you to the University Appointments Board for further handling,” the VC wrote.